Problems are an everyday fact of life in breweries. Some demand urgent action and the resources required to achieve instant results. Others drag on for years, never to be resolved. A single brewery may encounter hundreds or sometimes even thousands of problems each year. Many of these are destined to be repeated across other breweries within the brewery’s parent group costing a huge amount of money over the long term. A variety of tools can be put to use to resolve production problems encountered in breweries. Firstly an incident (a single incidence of a problem) is identified from its symptoms. Our aim is to define what’s gone wrong (the ‘fault’, ‘problem situation’ or ‘non-conformance’) and capture the what, when and where relating to the incident. Next we look to define the problem. At this point we want to understand why the problem is important (including understanding the financial and non-financial implications of the problem), have a clear idea what is and what’s not wrong, understand how urgently we need to find a solution to the problem, and understand potential root causes. From the root causes we’ll develop an appreciation of any co-symptoms that we might expect to see. Next data is collected to help discriminate different possible root causes of the problems. The key here is to capture all the symptoms associated with this incidence of the problem as an aid to future diagnosis. The data are then critically evaluated to allow as many possible root causes to be eliminated. Further data or experimental trials may be needed to reduce numerous possible root causes to one possibility and thus diagnose the true root cause. Where we are trying to get to is to have the who, what, when, and where of the problem – we need to identify the ‘point of cause‘ (the ‘smoking gun’). Having identified the root cause the next step is to identify a range of possible solutions that can be used to eliminate the root cause. Various tools can then be applied to analyse the strengths, weaknesses and inherent risks in implementation of the different potential solutions. One or more solutions are then chosen and implemented with the aim of achieving incident closure. At that time plans for following up on the incident to ensure that the underlying cause has been eliminated are also put into place. 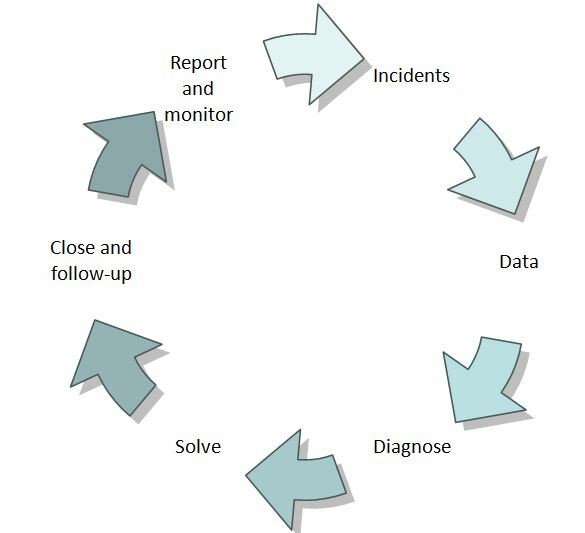 On-going monitoring and reporting are used to ensure that no re-occurrence of the problem takes place. The problem solving process is never finished until we are sure that the problem has gone away and is unlikely to ever appear again. Unfortunately, this key step is often missed out from many brewery problem-solving initiatives. This overall problem solving methodology can be used in different formats. For minor problems which need to be dealt with quickly (for example by implementation of a workaround) the process shown opposite is often effective. This type of problem solving process can be carried out either by an individual or by a small team comprising no more than two or three people. Some brewing companies use problem solving tools, such as ‘5 whys’ as an aid to such short-form problem-solving processes. More complex problems require more complex methodologies and the input of more people. Brewery problems are often open problems, that is they have more than one contributory cause (and therefore multiple potential solutions), rather than closed problems, which have only one cause (and therefore one solution). Thus many useful but nevertheless simplistic methods which are highly valued in other industries are of less use in the complex mix of biology, chemistry, physics, engineering and psychology which is the brewing process. The diagram below shows the methodology which we have been using within brewing companies for more than a decade with good results. We have applied this method to solving a variety of process problems, including beer off-flavour problems, beer taint problems, beer haze problems, beer foam problems, beer flavour stability problems, brewhouse extract yield problems, yeast viability problems, attenuation problems, filtration throughput problems and packaging efficiency problems. In our experience methods like this are best deployed with teams of 4 – 10 people. At the top end of the problem solving ‘tree’ are various Six Sigma techniques, including DMAIC (which stands for Define – Measure – Analyse – Improve – Control). Such techniques are ideal for application to larger infrastructural problems within brewing companies. These problem solving frameworks come to life through the use of specific tools, including Force-Field Analysis, Ishikawa Diagrams, Inverse Brainstorming, De Bono’s Six Thinking Hats and Failure Mode and Effects Analysis. Using these tools isn’t instinctive – training in their use is needed to get the best out of them. Sharing of information about problems in breweries and how they have been resolved has historically been inadequate. To an extent this has resulted from a lack of tools to facilitate sharing of information about brewery problems and solutions, rather than from a brewery’s resistance to making their problems more widely known within their peer group. A further obstacle to efficient problem solving has been availability of information, know-how and expertise. By way of example, consider that more than 350 individual faults can occur in packaged beer. Each of these faults may have, on average, 10 possible root causes. For each possible root causes there might be, on average, 20 or more viable solutions which could be used to eliminate the problem. Multiplied together this gives us a staggering 70,000 potential solutions to the problems that might occur in a modern brewery. It is little wonder that no single member of staff is capable of dealing with all potential problems in an efficient way. Thankfully, the reality is that there are only so many ways for us to damage product quality, product safety, or process efficiency in a brewery so the picture is not quite as complex as I have painted it. Nevertheless it is a knowledge management task which brewers underestimate at their peril. To understand the importance of efficient problem management in a modern brewery it is useful to consider the typical numbers of problems that arise in a given time in relation to bright beer and packaged beer. Benchmarking studies carried out with five breweries (average size of about 2M hl per year) representing three brewery groups have revealed a preference for categorizing problems with respect to accountability. This can be a useful thing to do. It helps spread the load. But it carries a risk. Most big problems in breweries start out as little ones. The high SO2 concentration that suddenly stops you being able to sell your product without breaking the law might have started out several months ago as a very small problem in the raking of your lauter bed. In our company we spend a lot of our time dealing with ‘fires’ that have got out of hand in breweries. All of them start as little ‘sparks’ that either no-one noticed, or were thought to be unimportant. What sorts of problems have you seen in breweries? Which are most difficult to completely eliminate? What could we breweries be doing better in this area? If there’s one thing to remember, when it comes to brewery problems always expect the unexpected. Face up to the fact that your brewery is going to run into problems – ignoring them is not going to make them go away. You have the potential to increase your profitability dramatically if you can get on top of, and eliminate, your five most important problems. What are you waiting for? Magic article – Breweries often forget to ad a financial value to their problems – this usually focuses the mind. Problem solving should also be seen as an opportunity to learn plant and process – this process will remove often “assumed” truths. Problem solving encourages lateral thought – this process helps identify potential future issues – this is massively valuable – and fun!